Buzzword has the ability to capture and retain the attention of an entire room full of people as team members combine their knowledge to solve a set of 10 clues. The answer to all just happens to be your buzzword. The game Buzzword involves a lot of discussion and team work as team work together quickly to find their buzzword before the timer goes off. If you are looking for a clever, fun, and unique group game, try playing Buzzword. It is just enough to test your skills but easy enough to make a fun night of it. Play the game Buzzword today! Be the first team to score 50 points and you win Buzzword! 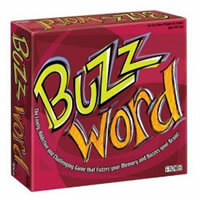 In the Buzzword game you will see 400 sets of Buzzword clues on 200 cards, 10 scoring cards, 45-second timer, scoreboard, marker and the Buzzword game rules and instructions. Please keep in mind that the official Buzzword party rules and instructions could be different depending on the game version you have. The rules below are some of the exact directions on how to play Buzzword. Share with us your comments, funny stories, tips, advice, strategies, creative ways to play, questions about how to play, problems with the rules or anything you want about Buzzword. All submissions will be reviewed within 24 hours. Click here to add your Buzzword comments. Our house long debated the interpretation of "turn" and what constitutes the end of the game. Does the "non playing" (non-reading) team get their final steal once the other team has read their card and reached 50? It is understandable and fair to allow the final steal immediately after the reading team reaches 50, to assure an even number of reads and steals between the two teams. However, the rules seem to describe a "turn" as reading the card during the timer. According to the rules then, the FIRST team to 50 after the teams have had the same number of turns ("reads") wins the game. Thus, the final opportunity to steal would not apply. The important thing is to settle the "house" rules before the game as to whether a "turn" will include the steal or not. Question: How long does the stealing team get to answer the questions the playing team missed ? We would like to know the same thing! Why add the phrase "when both teams have had an equal number of turns"? If Team A gets to 50, and Team B still has a turn, what good does it do for Team B to play its turn?